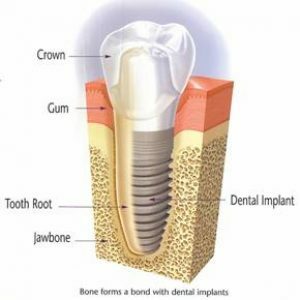 Dental implants are a great way of replacing missing teeth, as they look, feel, and function just like natural teeth. Dental implants don’t just enhance your appearance, they also improve your chewing abilities, which in turn improves your digestion and overall health. Our Orlando dental implants are comprised of small titanium posts that function as replacement tooth roots. These posts are installed surgically into the jawbone where they will heal over time. They function as the anchors and foundations for the artificial replacement teeth (crowns) that will be installed on them later. These titanium posts also prevent bone loss, which commonly occurs over time in the area of a missing tooth. Generally speaking, our Orlando dental implants are installed over the course of two different procedures. The small titanium posts are placed into the jawbone. Once installed, they are left to heal and bond with the jawbone for a period of three to six months while your new replacement teeth are being fabricated. 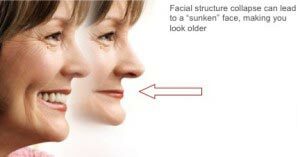 Dentures and partials can be worn during this time, combined with a diet of soft foods. Once the healing process is complete, and your replacement teeth have been created, it’s time to finish the procedure. This second procedure is very brief, and simply involves the placement of the new teeth onto the titanium posts. Once the treatment is complete, you will experience multiple benefits, as all of the functionality and aesthetic appeal of your natural teeth will be restored. You will be able to eat and smile with confidence again. At Oral-Facial Surgical Arts, we provide sedation and anesthesia for all relevant dental surgeries, and that includes dental implants. Placing a dental implant is far easier than removing a tooth, and when you are undergoing the procedure, you likely won’t feel a thing. In fact, the bone in which the implants will be placed does not have any pain-sensing nerves. Once the gum tissue is numbed, there should not be any pain at all. Some discomfort is normal for a few days following the surgery, but it is typically very manageable. Our Orlando dental implant procedure is safe, clean, and professional. Implants tend to be the preferred method of tooth replacement, as they fully restore the appearance and function of one’s teeth. They also solve many of the problems people tend to have with dentures and partials. Implants are clean, consistent, and reliable. At Oral-Facial Surgical Arts, we guarantee high quality and professional service conducted in a comfortable and relaxing environment. Our dental implants are guaranteed to be a reliable, consistent, and long-term solution to missing teeth. How good is your dental implant dentist?